Longtime entrepreneur and art market veteran, Carolyn Edlund (of Artsy Shark) is a bonafide business of art expert. With over 20 years at the helm of a successful production ceramic studio as well as an outstanding career in the business world, Carolyn has accrued a wealth of art industry knowledge. Through blog posts, artist updates and opportunities newsletters, and consulting, she provides valuable guidance on portfolio reviews, how to receive better juried show results, and more. In addition, Carolyn juries online submissions for Artsy Shark featured artists. We asked Carolyn to share her juried show submission tips, so you can give yourself the best chance of being accepted. Always familiarize yourself with what the show is about and what they’re looking for before you apply. You need to be a good match. Think through each opportunity clearly and ask yourself, “Is this right for me?” It’s a waste of time and money if it’s not. If you’re applying to fairs and festivals in your area go to ArtFairInsiders.com and ArtFairCalendar.com, or go to Zapplication.org and CallForEntry.org. Then you can get a good description of what’s available and what the opportunities are. Be sure to read the prospectus very carefully and make sure it’s the right fit for you and your art. If your work is outside the realm of what they want, you have a slim chance of being accepted. I would self-opt out and search for venues and shows that are the right fit for you. The ideal situation should be a no brainer. Your work should be a perfect match. Some artists don’t fully read the show’s application. There are so many artists in contention for the same slot that you have to make sure your application is complete. If it’s incomplete, late, or you didn’t follow the instructions, you have wasted time and money. Jurors do not have the time to search out or email applicants for additional information. Your application will be rejected if it’s incomplete. Sometimes artists don’t have a big enough body of work, so they include pieces that are not their best. You have to remember that you will be juried on the weakest piece you submit. One bad piece is going to drag you down. Make sure you take anything off your website or out of your submission that doesn’t work well because it’s going to hurt you. When a juror sees something that’s weak or doesn’t fit, it makes the juror question your judgment. For instance, if you’re an excellent landscape painter, don’t include an unsuccessful portrait in your submission. I encourage artists to be specialists, to go deeply into what they do best. It’s important to be known for one thing. If you try to appeal to everyone, you’ll appeal to no one. Be really good at what you choose to do. If you dabble in other mediums or styles apart from your signature, don’t put it on your website or try to match it to discordant works. It looks amateurish. Photo by 393edge. Creative Commons Attribution 2.0 Generic. Your work needs to be tightly cohesive if you’re submitting more than one image. There are artists that work in different styles and mediums, but this is not the place where you show the breadth of what you do. You need a highly recognizable and distinctive style that comes through in the pieces you’re submitting. So, if you’re submitting multiple pieces to a jury, each piece should relate to the others. The body of work should be synergistic. Its impact should be greater than a single piece. The order of submitted images can be quite important. Ask yourself, “Does my submission flow in a way that carries the juror through from the first to the last image? How do the images I submit tell a story? How do they guide the juror through the images?” For instance, if you submit landscapes, you might draw the viewer further into the landscape with each piece. People will remember that. Jurors are looking at images very quickly, you have two to three seconds to make an impression. You need a “wow” impact. You must submit excellent images of your artwork. Poor-quality images will ruin your chances before you ever seriously get considered because your art is badly represented. Artists spend many hours creating something of value and you need to honor your work by showing it in an excellent image. Certain mediums like glass, ceramics, and highly reflective surfaces are very difficult to photograph well yourself. These mediums need a professional. When I needed my art photographed, I went and found a professional photographer who was experienced in photographing art. He had two price sets, and gave a favorable price to artists because he enjoyed working with them. Find a photographer that wants to work with you. Two-dimensional artists, like painters, can learn how to take good photos. It’s fine to take your own photographs if you can truly take an outstanding shot. There are artists who get into festivals, exhibits, and shows - and who get in again and again - because they submit phenomenal photos of their art. They are the no brainers because they put so much effort into their presentation. 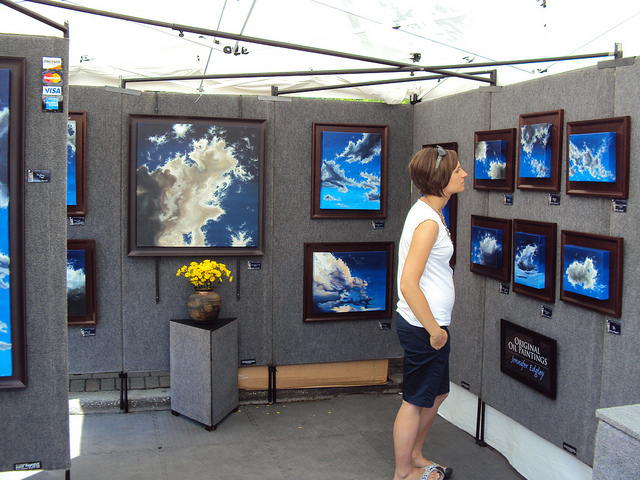 Fairs and festivals usually require a booth shot. Not only must your work be excellent, but the presentation must be professional and compelling. Show promoters don’t want an unprofessional booth to project negatively on them. I would highly advise you to set up your booth beforehand. Make sure it’s beautifully lit, your work is not cluttered or confusing, and the presentation is outstanding. If you are taking a booth photo, you can control lighting in your home or studio and that’s where you’ll get your best shots. Don’t have people in your booth shot, it needs to be just your art. Your booth shot is very important and a one can last for years. There will also usually be photographers that will offer to take booth shots at shows. The image itself is king, especially if the show is juried blind so the artist is not identified. But, an artist statement and CV are important. They can make a huge difference when it comes to the difficult part of submissions. When jurors look at images they can see what doesn’t belong, doesn’t fit, or if the quality isn’t there. There are the no brainers where the work is so incredible. Then jurors have to narrow down the number of good artists. I read the artist statement and CV to parse out those highly competitive submissions. Does the artist statement speak with clarity? I look to see if they know what they’re doing and trying to achieve; and understand what they’re saying and the concept behind their work. I look at the CV to see how long they have been showing their work. Experience does sway the jury, especially if an artist has been accepted into many shows and has received awards before. I also want to see if the work is recent. It is important that an artist is growing and evolving. A juror can’t always know this, but showing current work (in your submission and website) and continuing to create is important. Read Carolyn’s post on how to write an amazing artist statement for more tips. An artist shouldn’t take rejection personally because they might be up against ten people and there’s one slot available. It might be a style or a medium that is needed. It might not mean your work isn’t good (unless you’re consistently rejected). A juror may love your work, but you needed to get a better set of images. You’re not owed a critique, but it’s worth asking for some feedback if you have a contact email. You might get some really surprising comments. It might be that the work isn’t developed enough or the images have problems. Take it with a grain of salt though, because there’s no such thing as a juror who’s not biased in some way. They’re just people like everyone else. Jurors can only come from their own sensibilities and expertise when they decide what is the best work, especially when parsing out very competitive applicants. Sometimes it’s a very small thing that sways the jury. It could be one weaker image or that another applicant added in detail shots which showed the work’s rich texture or color. I love detail shots, but again it depends on what is allowed in the application. Make sure your presentation looks like you made an effort and care about your work. You can save money on the back end, but presentation is everything. Visual art is all about your image. Make sure what you’re telling people with your images and writing is the message you want to convey. If everything is compelling, you have a good chance if the competition is a match. And remember, your art can always continue to evolve. It’s not like you have what it takes or you don’t. 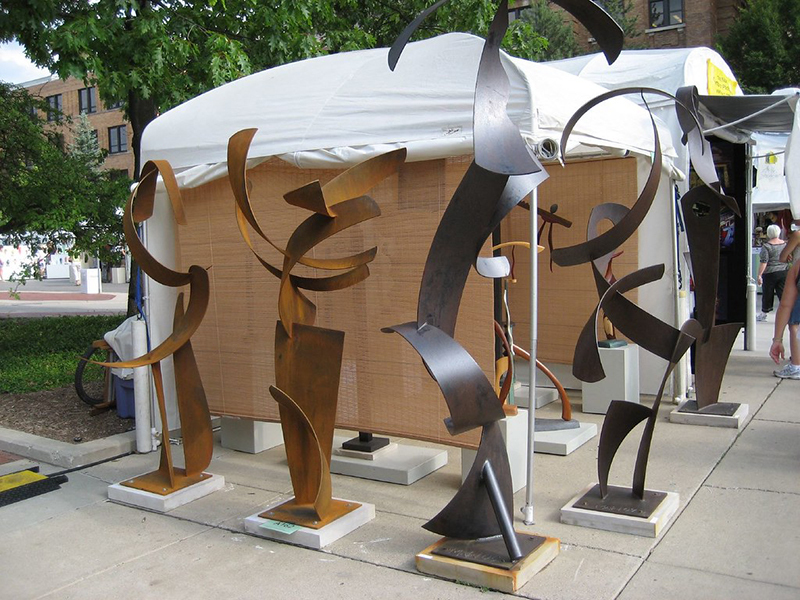 Applying to juried art shows and competitions is an ongoing process of improvement. Want to Learn More from Carolyn Edlund? Carolyn Edlund has more fantastic tips on the business of art on her blog and in her newsletter. Check out ArtsyShark.com, sign up for her newsletter, and follow Carolyn on Facebook and Twitter. Want to Organize Your Art Business and Receive More Art Career Tips? Sign Up for Free Here. Cory Huff (of The Abundant Artist) shares advice on how to successfully sell your artwork without a gallery, including licensing and leveraging art dealers. Ceramic artist Liz Crain creates deceptively-realistic vintage canisters and tins. Learn how this self-proclaimed introvert has achieved regional success through authenticity and focus.